This is the eighth article in a ten-part retrospective of the Harry Potter soundtracks. You may wish to refer to the previous entries in the series for more information. Keen-eyed Facebook users may vaguely remember a group created shortly after Half-Blood Prince called Draft Nobuo Uematsu to Score Harry Potter and the Deathly Hallows. Uematsu, you may know, is the composer of the Final Fantasy series of video games, and if you’ve heard his work, you know he’s perfectly capable of doing an entire film. Well, we didn’t get Uematsu. Instead, we got Alexandre Desplat, well-known in France for many films with French names, and in America for The Golden Compass, The King’s Speech, and, for some reason New Moon. The studio hired Desplat to score the final two films — a good idea, given that they’re really just one four-and-a-half-hour movie with a little extra exposition in the middle — and he created. Because there are two separate films, I’ve separated the review into two separate articles. (Lots of separation there, I know.) This one focuses on Harry Potter and the Deathly Hallows: Part 1. The score begins with “Obliviate”, a perfect musical backdrop to the beginning of the film, especially when Hermione casts the spell. It contains two themes: the four-note theme of the film (heard in almost every track in some form) along with a more-sweeping eight-note extension of same. The two themes are clearly heard throughout the film. Immediately after “Obliviate”, we get the four-note theme again, but this time descending instead of ascending, indicating that evil is afoot — and, I mean, it’s “Snape to Malfoy Manor”, so, yeah. Evil. And then we get another theme — a happier one — in “Polyjuice Potion”. Clearly you can see why I enjoyed this soundtrack. The composer is fully aware of the whole point of using a theme throughout the movie. He did leave off “Hedwig’s Theme” until the end of the third track, but with so many other themes, it’s rather like what I said about Patrick Doyle’s Goblet of Fire soundtrack. He does rather adeptly mix “Hedwig’s Theme” in with his own themes in “Sky Battle” — probably the most exciting part of the film, and the music reflects that. “Ministry of Magic” — This little sequence got its own “wizards doing wizard stuff” theme, although much more sinister, with the use of wooden clicky instruments (imagine several people hitting drumsticks together at the same time; I don’t know what they’re called) and a percussion part that’s like a ticking clock. Of course, now that we know the Ministry isn’t exactly doing their part to defeat Voldemort, the theme makes perfect sense. “Lovegood” — Suitably weird, for use with all Quibbler publishers and Deathly Hallows enthusiasts. In the next paragraph, I do complain a little about the technique Desplat uses in this track, but in this particular track, I felt the effect worked well. “Farewell to Dobby” — Let’s be honest: very few people who only saw the films probably appreciated Dobby. Even in the books, he was annoying. In fact, only Ministry of Magic managed to make me care about him with their song “Evanesco Dobby”. But as a cut to basically end the film, this track contains all the themes and all the foreboding that is necessary to close out the first half. A very nice track (despite the violin fugue at the end). I was a little less impressed with the middle part of “Harry and Ginny”, which gives kind of a strangely-tempo’d and uncomfortable balletic violin hit to a nice piano rendition of the happier theme from “Polyjuice Potion”. He uses a similar tempo technique in “Dobby” that felt a little out-of-place. Then there’s the obligatory use of chorus to indicate “holy crap, danger for our heroes in the first act, which means get excited although none of them are going to die” (“Fireplaces Escape”); choral parts get overused, I think, in film scores. And, in “Ron Leaves”, the soap-opera-y violin part over the top is… well… over the top. And I think that’s the only major issue I have with this soundtrack: Desplat has an annoying tendency to put another instrument playing a fugue or sustain over the main part of the orchestra. I counted at least four tracks it happened in within the first half of a 29-track album. I also didn’t care for “The Exodus”, but mostly because it was a montage of Harry, Ron, and Hermione going camping a lot and negative memories of that part of the film and book probably affected it. Also, the violin part annoyed my ears (though, if you listen carefully, you can just barely hear a John Williams-like musical phrase last heard in Chamber of Secrets… you’ll have to listen really hard, though, because it’s hidden pretty deeply in the orchestration). 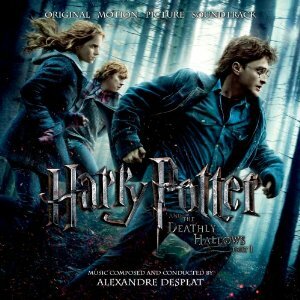 Overall I was very pleased with Desplat’s soundtrack for the first half of Deathly Hallows. I was leery at first, but the studio really came through with a good choice for the film’s score, and I was quite looking forward to what he would do with Part Two. He proved he can do films, he can do homages, he can hint ahead at future tracks… basically, everything that I praised Patrick Doyle for — and, as I said, he wrote my favorite soundtrack of the series. But this one’s pretty good too.